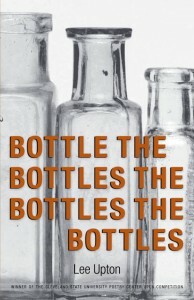 Just in time for National Poetry Month, Lee Upton, professor of English and writer-in-residence, has published her sixth book of poetry, Bottle the Bottles the Bottles the Bottles. In order to provide a unique perspective on the book and Upton’s creative process, Owen McLeod, associate professor of philosophy, read the volume and compiled the questions below. Lafayette’s celebration of National Poetry Month includes the annual Favorite Poetry Reading, the New Writer’s Cabaret, lectures, and sessions recognizing the student winners of the College’s annual MacKnight Black Competition in Poetry and Jean Corrie Poetry Competition. Listen to their poems in the sidebar below. Bottle the Bottles the Bottles the Bottles is your sixth published volume of poetry. Would you talk about the unusual title as well as the title poem? I didn’t intend for the book to include so many bottles—but the bottles just kept arriving. Terrariums. Bottled up emotions. Bureaucracy and its many bottle necks. Bottled spirits. The body “bottled” by threats of violence and illness. I think, too, that bottles as objects often are visually interesting and suggest the sort of contained pressure that we sometimes expect from poems. I just learned from the book’s designer, Amy Freels, that the bottles photographed for the cover of Bottle the Bottles the Bottles the Bottles are only a few inches high—the size of some poems. On the cover the bottles look large and imposing. I like the way our perception of scale can be manipulated by both photographs and poems. The title poem reflects on the experience of rejection. The poem ends: “That man would criticize Vermeer/for the way the milk pours.” Who hasn’t been rejected or unfairly criticized? That poem’s for everybody. Some poetry just seems like prose with very wide and irregular right margins. Your poems are not like that. One reason for this is that your poems display genuine poetic form—in fact, a variety of poetic forms. Would you talk about poetic form—its meaning and importance for you, and how you go about deciding what form a particular poem ought to take? I’ve experimented with traditional forms, but most often my poems achieve their shapes through patterns of repetition that emerge as each poem develops over time. Every poem creates its own form, its own vocal emphases, and so many of those choices grow from trial and error, an investment in discovering the mystery inherent in the potential poem, and from testing the poem’s lines by reading them aloud. someone said, Why write that? but, then, I wasn’t myself. These lines raise—and begin to answer—a question about whether poetry ought to express shared experience, or instead confine itself to experiences peculiar to the poet. Would you talk about the “universal” and the “particular” and the implied dilemma of writing either too broadly or too narrowly? The poem is autobiographical. I had heard the complaint, and I identified with the accused woman’s need to create a memorial in words at the same time as I felt the sting of the question. Elegies are reinvented perpetually because we need them. Writing—to attain its power—draws from the particular, the specific, the texture of life in its many fine-grained dimensions. We each are irreplaceable, entirely “particular.” I don’t think of what is universal when writing, but of what is specific. I want to assume that the universal must take care of itself. Some contemporary poetry—John Ashbery’s for example—is evocative, delightful, even moving, but also seemingly nonsensical. Your poems, while often riddling, do seem to make sense. They’re about something. Why is “aboutness” important to you? I think that John Ashbery’s poetry is “about” something too—and I think his poems are even about “aboutness.” Poems are encounters, intensive experiences. We import meanings to poems and in giving words painstaking attention we alter our own perceptions. My poems are never innocent or neutral. They have a stake in the world and make their claims. I think that the struggle against despair is part of poetry’s often unacknowledged work. We shouldn’t feel duped if we discover that a short story or novel bears no relationship to the writer’s life. We might feel deceived, however, if we learn that a poet hasn’t directly experienced what the poem is about—as if the poet has been dishonest with us. Why is there this difference in our attitudes? Isn’t the poet, like the fiction writer, free to make the whole thing up? Yes, the poet should be free to make anything up, and readers are short-changing both themselves and poets if they think otherwise. Milton never met Satan, at least not in his lifetime (I’m supposing), and Emily Dickinson wasn’t dead when she wrote in the voice of a corpse who hears a fly buzz. Some fiction writers, like some poets, don’t escape expectations that they’re writing about their own direct, unmediated experiences either. I just heard a novelist lament about this tendency two days ago at a conference. I do think, though, that you’re right that sometimes poets bear more of the burden. That’s a shame. One of the wonderful things about writing and reading poetry or fiction is that both allow us to imagine our way into other perspectives, other lives, and to extend our imaginative reach. Why shouldn’t poets use any means possible—including donning masks and speaking in multiple voices—to make discoveries? Why should we be content with what we already know? 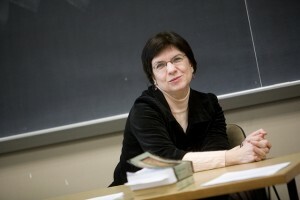 You teach many creative writing courses, including ones that focus on the writing of poetry. Are there objective standards for excellence in poetry? Even if there are no such standards, what features, in your view, tend to make a poem strong or significant, and how do you get students to appreciate and write poems that include these features? Poetry and fiction often outwit over-arching principles. I teach humor writing, and I can offer one generalization about writing imaginatively that humor writing makes especially clear: poetry, fiction, and humor writing all thrive on surprise, on creating enhanced states of attention in readers and listeners who can’t entirely predict the writers’ next move. In my courses I try to look at each piece of writing to see what new rules it’s setting up. Much of the work I do in any creative writing course involves isolating craft elements and exposing students to a wide range of writing styles and practices that may help them develop work that’s vivid and resonant. I want students to experiment and extend their repertoire of techniques. I want them to find ways to use language in a newly heightened and exciting way. Often that means devising assignments that ask students to try out structures they might have previously avoided. Sometimes that means encouraging students to see what is potentially intriguing about the colloquial language that they’re already using. In A Moveable Feast, Hemingway has a poet friend remark, “The completely unambitious writer and the really good unpublished poem are the things we lack most.” You recently published a book of essays—Swallowing the Sea (Tupelo Press, 2012)—on the nature and value of literary ambition. What do you make of this poet’s remark? Maybe times have changed. We don’t lack for unambitious writers or strong unpublished poems. In Swallowing the Sea I wrote in defense of literary ambition, of aspiring to create work that defies the writers’ sense of personal limitation. Perhaps, in broader terms, the quotation refers to writers who focus single-mindedly on the writing itself rather than on any external rewards, including publication. That sort of focus on the dynamics of writing can be understood as a form of ambition in the sense in which I use the term in Swallowing the Sea. Actually, maybe times haven’t changed. Emily Dickinson could be my obvious witness: As we know, during her lifetime the great bulk of her poems went unpublished and those few that were published were altered and “regularized.” We have her poems now, but who knows what poems by other poets have never been read? We’ve probably never lacked for strong poems that have gone unpublished. We probably never will. Despite the Internet. What thought-provoking queries and such direct and roundly shaped answers. A mini-course in poetry right here! Bravo to Owen for posing such wonderful questions and, of course, to Lee for both the expected and unexpected brilliance of her answers.